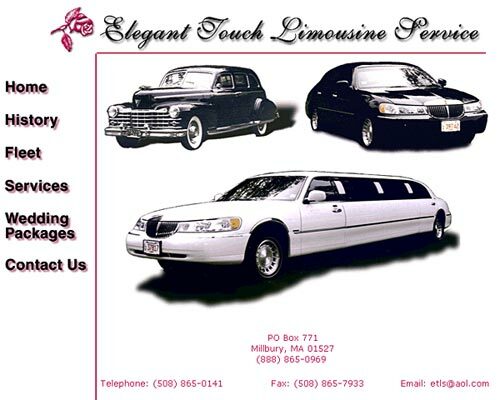 Elegant Touch Limousine Service is a privately owned family business that was started in 1989. The business was started with one limousine and has since grown to a fleet of ten vehicles. The goal of Elegant Touch was to extend their existing client access as well as make potential new clients aware of their services. The goal of the site was to present a clean, straight-forward site that would act as a brochure that would showcase their services, give background on the company and broaden their accessibility. Because their specialties are weddings and special occasions, I tried to give the site a photo album look by feathering the edges of images, using white backgrounds and reddish focal text for color. I also kept the width of the page below 800 pixels wide so that visitors to the site using laptops would not have to scroll horizontally. The use of stylesheet tags helps insure that the site will have cross-browser compatibility and look the same regardless of browser or platform.